In our previous small business outsourcing blog and Part 1 of our two-part event “Building a Team of Experts”, we discussed the importance of finding external partners to handle the areas of your business where you are not an expert. We identified the 6 key roles most small businesses turn to for outsourcing: banking, accounting, legal, insurance, technology, and mentoring tasks. Here in Part 2, we discuss the trick to finding the right, reliable partners that will benefit your business and make your life easier — not more difficult. Your best results for small business outsourcing will come from partnering with local experts. A local partnership affords you the opportunity for face-to-face meetings, instead of collaborating solely through email or over the phone. You can always start with a Google search for “accountants / business law / insurance companies near me.” This will return plenty of options to start exploring. But how can you tell if they’re the right fit for your business? 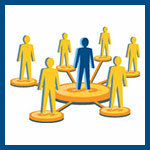 Use personal referrals or networking events to learn about potential business partners. Word of mouth referrals from friends, family members, or better yet, other small business owners are a better guarantee that you’ll find a professional with a successful track record. Networking events can help you in two ways. Number one, as you get to know other small business owners you can ask for references. Number two, you may have the chance to meet local experts first-hand. If you are the member of a local Chamber, industry-specific organization, or other small business professional group, take advantage of the networking events that they host. What is the complete list of services you provide? What are your billing rates and billing schedule? What will the client’s role be in the partnership? What may be even more important than the answers you hear is the “gut feeling” you get from meeting with each business. If you have a feeling that you would work well or not work well with a potential partner — trust yourself!